The company has filed for a patent for “multi-level fulfillment centers” that would accommodate the landing and takeoff of drones in dense urban settings, the latest example of Amazon’s futuristic vision of reshaping the way people receive packages. 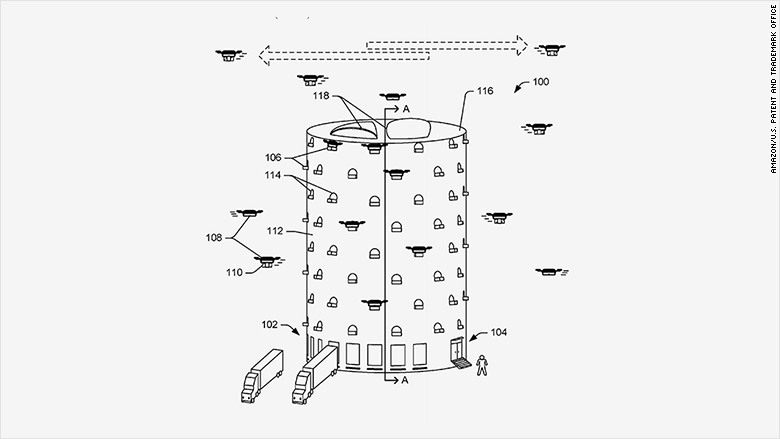 The application filed with the US Patent and Trademark Office, which was written in 2015 and published last week, included a number of drawings of drones flying in and out of tall cylinder-shaped buildings that Amazon wants to locate in central metropolitan areas. The centers would allow Amazon to shift away from the traditional model of large single-story warehouses that temporarily store packages before they are shipped to customers. Those buildings are typically located on the outskirts of urban areas and are not convenient for deliveries into cities where populations continue to swell, the company noted. “By locating the fulfillment centers within the cities, items may be more quickly delivered to the growing population of people that live in the cities, as well as the large population of people who work in the cities,” the application said. The centers could be used to fulfill hundreds of thousands of orders a day, in part relying on a large volume of drones that continually pick up deliveries and can recharge their batteries at the site. The drone centers could also have a “central command” to control flight operations, which would be similar to a flight controller at an airport, Amazon said. The buildings would also allow for traditional vehicle deliveries and could possibly include a self-service location for customers to pick up items in person. If Amazon moves forward with its vision of urban drone centers outlined in the patent application, the Seattle-based corporation could also likely face a range of obstacles in the regulation of the nascent industry of commercial drones – including attempts to control their movement and local zoning and development laws. Amazon announced last year that it would partner with the British government to run tests exploring the viability of delivering small parcels by drone, launching the first testing of its kind in the UK. The company said it successfully tested its Prime Air drone service in Cambridge in December when its unmanned aircrafts delivered a bag of popcorn and TV streaming stick to a customer’s garden. The company also made headlines last year with a patent for flying warehouses, called “airborne fulfillment centers”, that could be located above metropolitan areas, functioning like giant airships coordinating drone deliveries. Amazon has also filed a patent for the parachute-aided delivery of packages, meaning drones could release parcels from above, deployed with parachutes that allow them to safely land to customers. Some skeptics have argued that the flurry of drone-related patents is as much about garnering free publicity as it is about innovation. News of the patent for urban drone centers comes on the heels of Amazon’s move into traditional retailing with the purchase of Whole Foods Market. 2015 © Powered by Tack Tech IT Team. This function has been disabled for Tack Tech Technologies.